Vascular anastomosis is considered to be the foundation of plastic and reconstructive surgery. All tissue or organ transplantation requires vascular anastomosis, such as finger reconstruction and vessel transplantation. The difficulty of the surgery increases with the decreasing of vessel diameter. For example microvascular anastomosis for vessels with diameter less than 1 mm and super microvascular anastomosis for vessels with diameter less than 0.5 mm have always been a challenge clinically. Nowadays there is a strong demand for an intraoperative surgical evaluation tool that can help the surgeons assess the quality of anastomosis and predict the long term surgical outcome objectively and reliably. Though conventional methods such as Doppler ultrasound probe, laser Doppler flowmeter, laser assisted ICG fluorescence imaging, Ultrasound Imaging, CT and MRI though were proposed, they have various intrinsic disadvantages such as low resolution, slow imaging speed and poor stability. Fourier domain Doppler optical coherence tomography (OCT) is a real-time high resolution 3D imaging modality that can provide both structure and flow information of the vessels non-invasively. 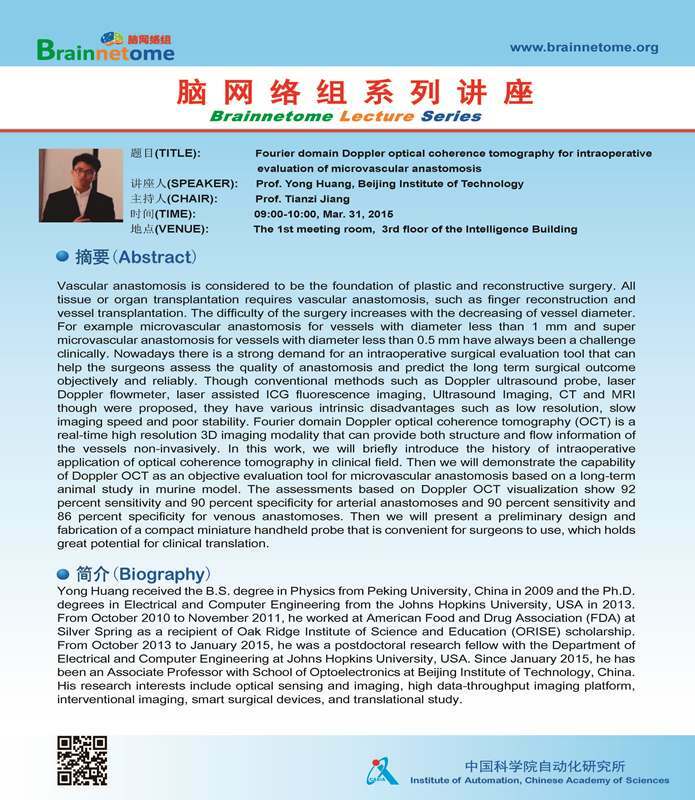 In this work, we will briefly introduce the history of intraoperative application of optical coherence tomography in clinical field. Then we will demonstrate the capability of Doppler OCT as an objective evaluation tool for microvascular anastomosis based on a long-term animal study in murine model. The assessments based on Doppler OCT visualization show 92 percent sensitivity and 90 percent specificity for arterial anastomoses and 90 percent sensitivity and 86 percent specificity for venous anastomoses. Then we will present a preliminary design and fabrication of a compact miniature handheld probe that is convenient for surgeons to use, which holds great potential for clinical translation. Yong Huang received the B.S. degree in Physics from Peking University, China in 2009 and the Ph.D. degrees in Electrical and Computer Engineering from the Johns Hopkins University, USA in 2013. From October 2010 to November 2011, he worked at American Food and Drug Association (FDA) at Silver Spring as a recipient of Oak Ridge Institute of Science and Education (ORISE) scholarship. From October 2013 to January 2015, he was a postdoctoral research fellow with the Department of Electrical and Computer Engineering at Johns Hopkins University, USA. Since January 2015, he has been an Associate Professor with School of Optoelectronics at Beijing Institute of Technology, China. His research interests include optical sensing and imaging, high data-throughput imaging platform, interventional imaging, smart surgical devices, and translational study.